For cisterns and drainage solutions, Geberit is your connection to quality. Whether you’re building or renovating, the Geberit product range is designed for you. 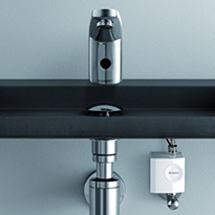 Geberit is globally renowned as a market leader in sanity systems, with many products invisible once installed. Thanks to their high-quality and reliability, they fulfil their functions for decades at a time. Why choose a Geberit concealed cistern? Australia’s obsession with the once unheralded bathroom is at an all-time high, and along with the kitchen, it is now often considered to be the star of many homes and apartments. A concealed cistern will give your bathroom a stylish, sleek and minimalist finish without compromising on function.